Due to overwhelming demand, HomeMD has extended their coverage area to most of the expanded Greater Toronto Area. HomeMD’s new expanded service area stretches from Lake Ontario in the south to Teston Road in the north, and from Highway 400 on the west to Highway 404/DVP to the east, which is nearly 4 times the size of our previous coverage area. Many of our new patients simply felt that there was still excellent value in the unlimited monthly home visits and medical video consultations made available to them via the app. Many minor health issues are quickly and easily dealt with over video conference, and those that require further investigations can be assessed in the comfort of their own home. Of course, the option to visit the clinic is still available to all HomeMD patients, regardless of location. HomeMD is a client centered health care service that starts with the simple download of our app. Initially serving a bounded area in mid-town Toronto, we have now expanded our service area throughout Toronto and the GTA. To meet these growing demands, our professional, qualified nurse practitioners are able to assess, diagnose and treat many health issues via telemedicine or home visits. Nurse practitioners are already the primary care providers for 3 million Canadians, and now, with HomeMD, primary care has never been more accessible and efficient. 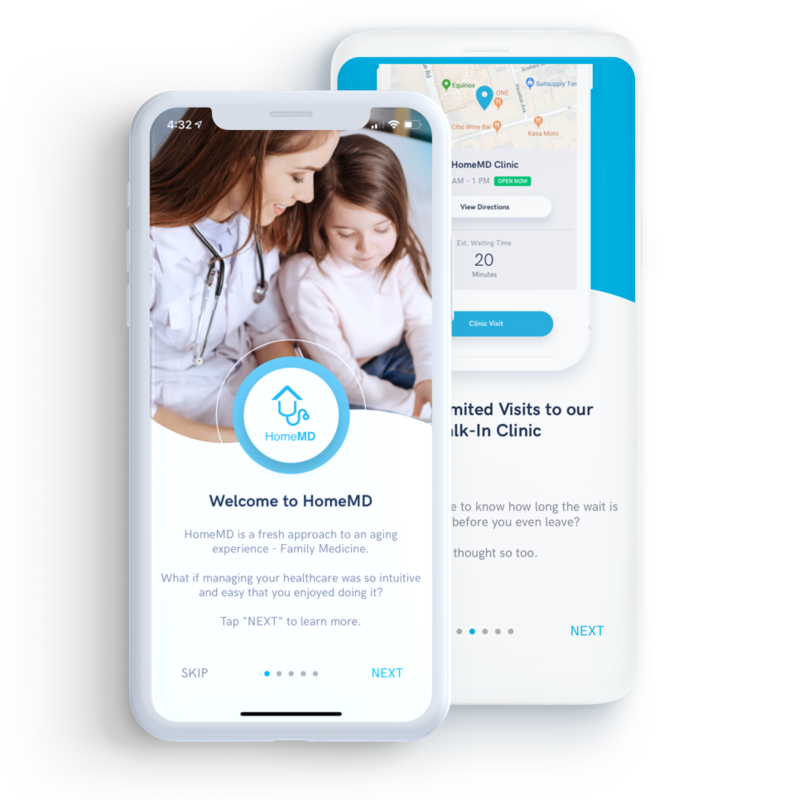 HomeMD is a digital-first primary health care solution that now offers an expanded service area due to increased demand. For $50 per month you can join our all access plan, in which you receive unlimited access to medical video consultations, medical home visits and clinic visits. Now that HomeMD has expanded its coverage area, we are happy to offer clients who were previously outside our boundaries quality medical service, across three platforms. Visits to our mid-town Toronto clinic, along with medical video consultation and home visits are the three ways to access effective, timely primary care, all from your device or computer. Many Toronto and GTA residents simply do not have access to primary medical care and HomeMD is not only filling that need, but expanding to additional locales in the interest of serving patients who require medical care. Our nurse practitioners will assess your medical needs, offer a diagnosis and if required, a treatment. Nurse practitioners are licensed professionals who can perform most primary care functions independently. Among many other services, HomeMD can address a minor medical concern, a chronic illness or the need for a medical consultation note. We can bring primary care to your device or your home via medical video consultation or home visits within our new, expanded service area. HomeMD’s newly–expanded coverage area will allow more Toronto and GTA residents timely access to primary medical care. With wait times, both in walk-in clinics and hospitals, at an all-time high, an alternative service was desperately needed. By offering patients the opportunity to get medical advice and treatment when needed, not one or two weeks later, we are helping people take control of their health. Part of maintaining good health is having access to quality health care, regular screening and dealing with issues as they come up. By expanding our service area, HomeMD is offering these benefits and more to thousands more patients. As a result they can expect better health care and in turn, better health. Welcome to the next evolution of family medicine in Canada. Now serving the Toronto area, HomeMD features a powerful new app offering a unique platform designed to make your life easier and healthier. Our new software is the next step in client-centered care. It reflects our goal to design our family practice around you, our client, and to provide the treatment you need, when and how you need it. Secure digital access to all your medical records;Unlimited home visits by our medical professionals;Unlimited visits to our state of the art medical clinic conveniently located in mid-town Toronto;Unlimited Video Consultations with our Medical Professionals. At HomeMD we feel it’s vital to feel trust and confidence in your health care team. By not rushing our clients, we deliver superior health outcomes. We take the time to get to know you as an individual and build a meaningful relationship. Your optimal health is what we care about. Download our app today.